Cloud is in his grunge phase, as evidenced by the dirt on his coat. 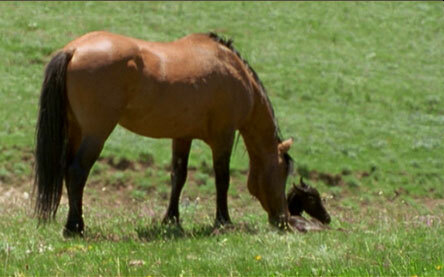 Here, he is actively engaged in trying to steal an entire band of mares from Mateo, another stallion. The Filmmaker's Take: "Cloud was filthy for much of the time he was a four-year-old. He would roll around in sand and mud and be perpetually dirty, which was interesting because as a younger horse he was always so clean." 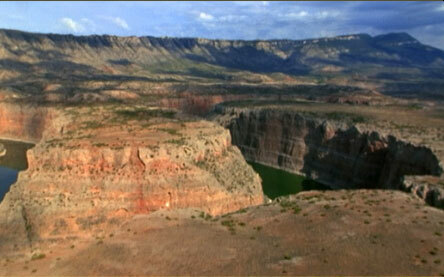 This photo -- a dramatic view of Bighorn Canyon with the horse range and Sykes Ridge in the background -- was taken from the air. Diamond is Cloud's older brother by a year. Here, he waits on a hilltop for Cloud and the other bachelors to come up the mountain. Horse Fact: Diamond is a blue roan. A color indication, the designation "roan" means a coat that is made up of a combination of any base color of hair and white hair. Blue roans combine black and white hair to create a steel blue color. The white marking on Diamond's head is called a "star." Here, two Bureau of Land Management (BLM) roundup specialists gate bachelor horses for processing. 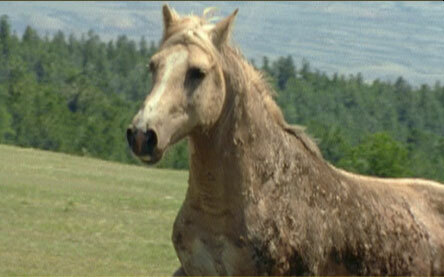 Regular round-ups are performed to keep control of the wild horse population. 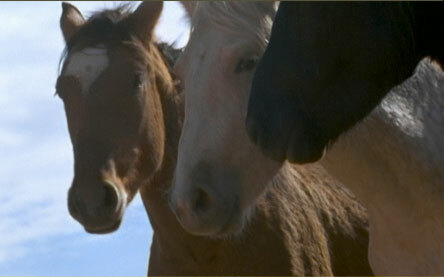 Cloud's been incarcerated into the Bureau of Land Management (BLM) corral, and here he is with two of his bachelor buddies. Shortly after this picture was taken, Cloud was separated and isolated from all the others, who were processed for adoption. The Filmmaker's Take: "Here, I filmed Cloud from a low angle and he's looking right at me. The impression I got of him was that he was saying, 'Get me out of here!'" 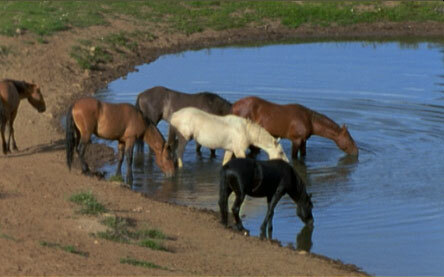 Cloud and his bachelor friends drink from a water hole. Within a few weeks, every horse in the photo, save Cloud, will be rounded up and sold for adoption. Horse Fact: As the snow melts in the Spring, wild horses climb the mountain past the snow line in search of emerging water sources. 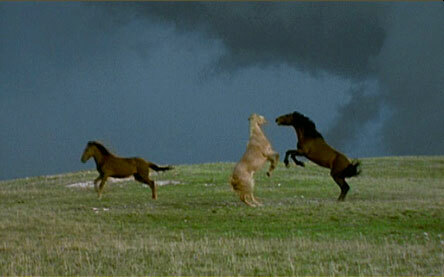 Two stallions are vying for the mare at the left-hand side of the frame. 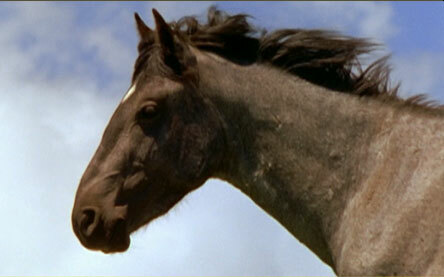 The Filmmaker's Take: "When Cloud was little, I don't remember any horses being struck by lightning. I have not a clue why this has changed, but it appears that weather patterns may have changed and that lightning has become an increasing killer on the mountaintop." The top of the Arrowhead Mountains are incredibly dramatic weather-wise. Here, a storm moves in quickly at sunset. The Filmmaker's Take: "The clouds looked like they were being filmed in time-lapse, but they weren't; they were just blowing unbelievably fast across the top of the mountain." Whether it was stepped on or just born weak to a young mare, this newborn foal isn't strong enough to survive. Winter temperatures in the Arrowhead Mountains can dip as low as 60-70 degrees below zero Fahrenheit. 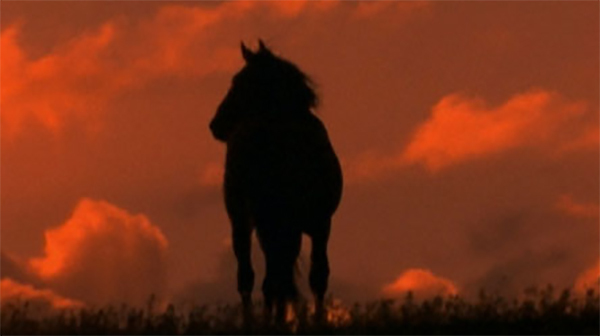 The Filmmaker's Take: "I finally realized that Cloud did not stay on the horse range in the winter, and a hunter mentioned that he had seen Cloud running down a road in this Lost Water Canyon. So here I'm snowshoeing toward the canyon because I can see horses in the distance." 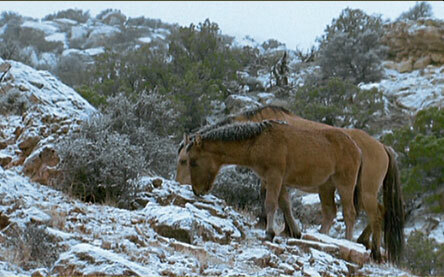 Horses forage during the harsh winter season. 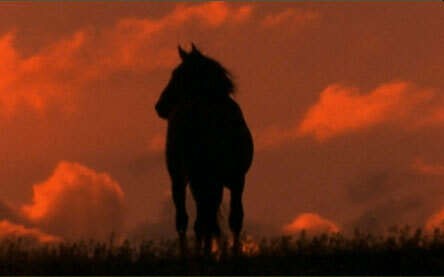 The Filmmaker's Take: "Usually, everything shuts down in the winter and the horses don't move around too much. One interesting point is that wild horses tend to be smaller than domesticated breeds because they need to be more efficient and require less food than their cared-for brethren." 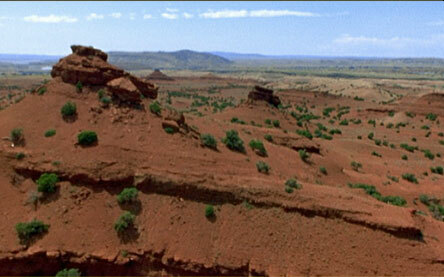 There is a large amount of iron in the desert soil, which gives it a reddish hue. The Filmmaker's Take: "Because you have a desert all the way up until you hit sub-alpine, the Arrowheads boast the largest number of plant species of any area of Montana."